Your big day is around the corner and you are confident of your overall looks barring one thing – your teeth! They are yellow, stained and umm.. ugly! You want to look beautiful on your wedding with no flaw; but these teeth are worrying you! What to do? 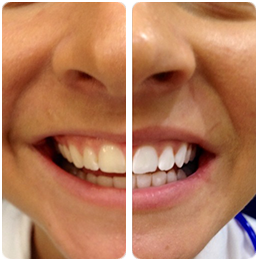 Here are two natural teeth whitening formulae, tried and tested by many brides. You don’t have to be shocked with baking soda. Sodium bicarbonate or baking soda is a mild abrasive and will gently scrub your teeth’s surface to eliminate stains and bring back the whiteness. It is also alkaline (actually it is an alkali) so protects your teeth from the food acids that eat teeth away. Lemon juice is a natural source of vitamin C – vital for the health of teeth and gums. Moreover it acts as natural bleach for them. So, make a paste of the two and apply. But don’t overdo it. Best is to use baking soda + water on some days, and baking soda + lemon juice on others. Take generous amounts of baking soda and lemon juice or water, enough to make a paste. Put the paste on your toothbrush and apply to teeth. Leave it for a minute and rinse. If you are using water, you can leave it for 3 minutes. Strawberries also are rich in vitamin C and break down plaque that makes your teeth look yellow. They also have another important ingredient known as malic acid which is an enzyme which removes stains on the surface of teeth. Salt here acts as an abrasive, scrubbing out the stain-causing gunk and baking soda adds an extra benefit of scrubbing and neutralizing acid. But you can avoid using it. Mash strawberries to form a pulp and add ½ teaspoon of baking soda (optional) and a pinch of sea salt. Put the mixture on your toothbrush and apply. Leave for 5 minutes and rinse. Do this at night. And if you are too lazy to prepare these mixtures or if you have no time to make them during the hassle of your wedding preparations, make an appointment with the teeth-whitening experts at Pure Smile who use 100% safe and long lasting teeth whitening treatment. Use their fantastic all-natural peroxide-free tooth-whitening gel. That will bring back your confidence as a bride and you can have a great peace of mind and a great smile on your big day.